Have You Found a Natural Arabian Gulf Pearl? The waters of the Arabian Gulf are famed for their natural pearls. Thoughts of Persian gulf pearls immediately conjure up pictures in one's mind of treasure chests brimming with luxurious pearl jewelry mixed with diamonds, emeralds and rubies...the stuff of fairy tales, but it is only a fairy tale? Natural gulf pearls are among the finest in the world and are still being found today in the many countries that surround the gulf such as the United Arab Emirates, Iran, Kuwait, Saudi Arabia, Bahrain, Qatar and Oman. If you have found a natural gulf pearl please share it along with its detailed story. Do you have a Natural Arabian Gulf Pearl? Please share with us your natural Arabian Gulf pearls. Buy natural Persian(Arabian)Gulf jewelry here. 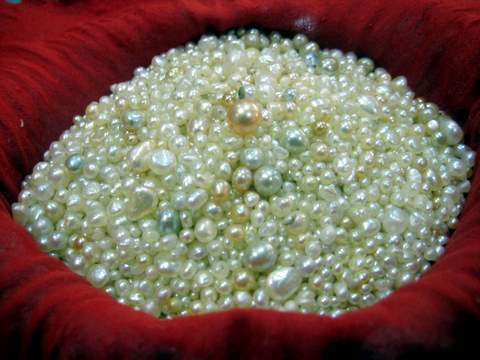 Learn more about natural pearls after Arabian Gulf pearls here. Read about more natural pearls that folks have found.